On the left you can see the Actian Zen Embedded Library -- special components designed to be built into applications for the Internet of Things (IoT) world, to enable you to capture data on IoT endpoints, including sensors, smart phones, and small devices like the Raspberry Pi and Windows Nano Server. The extremely small footprint of the Zen database product makes it ideal for these environments where processing power, memory, and storage are extremely limited. Once that data has been collected and processed within the IoT endpoint, the data can be pushed or aggregated into a central database for additional processing (such as deduplication) and reporting. It can also be merged with data stored within other SMB database application environments, such as those used for accounting, SPC data tracking, healthcare data, airlines, and more. By leveraging the power of full-blown Windows and Linux servers here, the Actian Zen Database Engine can handle substantially larger data sets and heavier processing workloads, up to hundreds of users or more. There are currently three editions of the Zen Embedded Database, namely the Workgroup Engine (for up to 5 concurrent users and a limited feature set), the Server Engine (for 6+ concurrent users), and the Vx Server Engine, supported unlimited users and licensed only by data size -- suitable for internet and SaaS solutions. One of the challenges faced by any database engine is high-speed reporting and analytics. A row-based environment like Actian Zen is ideal for maintaining large quantities of data accurately and controlling multiple users that need to update the data simultaneously. However, such an environment is not well suited for analytics. Enter the Actian Vector database engine. The Vector database provides a column-based data store which can provide results, but at a speed that can be as much as 100x faster than a row-based database! This superior performance can be used to quickly generate dashboards, show trends within data, isolate sensor data that is out of a normal range, and coalesce your data into usable management reports. At the far right, we see the Actian X Hybrid database. This combination of Ingres and Vector provides a high-end, enterprise-class, database environment for your applications, where you can leverage the SQL interface for Ingres to store your data, and yet still attain the reporting benefits of Vector. Connecting these various layers in the picture above is a component called Actian DataConnect. This integration tool supports classic ETL (Extract, Transform, and Load) operations for both simple and complex data conversions, as well as filtering and aggregation functions. While this tool exists today, the level of functionality it offers at the lower end (to the Zen Embedded Library and Zen Embedded Database) data is still a bit limited. We expect that they will start to address this in the upcoming releases. While you are waiting for Actian to complete their picture, however, you should know that Goldstar Software has solutions for you today! Our DDF2XML tool can extract the database definitions from your Zen/PSQL database and generate CREATE statements for the Vector database. Another tool, GSSync, can pull data records out of the Zen databases and send them over to the Vector environment, much like the DataConnect product. Where GSSync shines, however, is in the handling of legacy and variant data types, as well as being able to identify changed records in your Zen/PSQL data, and update only the changed records in the Vector side, saving processing time and limiting changes. The Zen Embedded Library is not quite available yet, but should be available for some platforms in late 2017 or early 2018. Exact details on platforms and pricing are yet to be announced, but we expect solutions for the Raspberry Pi and Android to be available first. The Actian Zen Embedded Database is formerly known as Actian PSQL, Pervasive PSQL, Pervasive.SQL, and even Btrieve and NetWare SQL. This database engine continues the long-standing history of providing a direct record-level access method with extremely high performance and a high degree of flexibility for the developer with respect to data structures. It is the original NoSQL database, but it ALSO includes a full ANSI-compliant SQL engine that can be accessed through ODBC, JDBC, ADO.NET, and other interfaces. It supports database record sizes to 4GB, and individual data file sizes up to 256GB, and it has become the database engine of choice for applications within just about every vertical markets, including airlines, banks, dentists, doctor's offices, funeral homes, insurance companies, long term care facilities, steel mills, timber harvesting, and utilities. As with previous versions (Actian PSQL v12 and older), Zen v13 is available for Windows in both 32-bit and 64-bit levels. The Linux engine is expected to be a 64-bit version only, but it will not be available until Service Pack 1, some time towards the end of 2017. We do not expect compatible versions of DataExchange and AuditMaster until 2018 at the earliest. 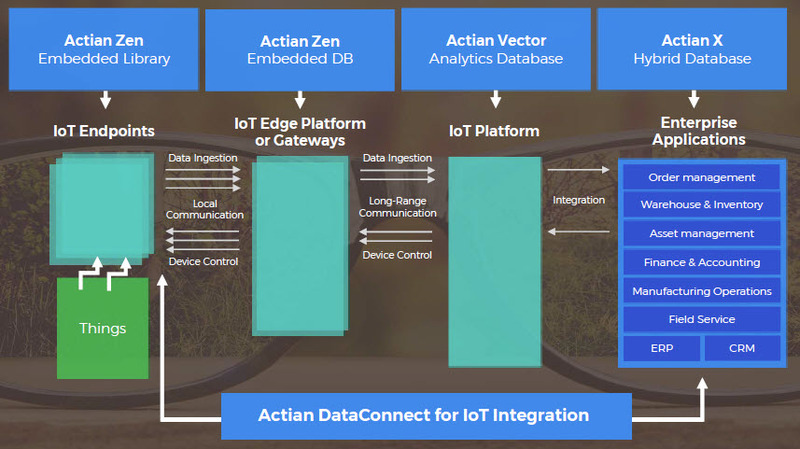 Right now, the embedded product name is still Actian PSQL v13, but this name will be retired in favor of the new name which conveys the primary features of Zen -- Zero-DBA, Embeddable, and Nano-footprint (i.e. small size). What's New In Zen v13? Support for Larger Data Sets: The new v13 file format supports files as large as 64TB and with up to 18 quintillion records! A new BTRVEX function is needed to access systems over 4 billion records, but this can be phased into your code, modifying applications only where needed. PSQL Reporting Engine: Many users have asked for this feature over the years, and it has finally come to fruition! Included FREE with PSQL v13 is a new Reporting Engine (RE), which allows you to set up a secondary PSQL server for reporting purposes. Now, you can off-load your SQL queries and reports, preserving the performance of your production server. New Btrieve C and C++ APIs: Simpler development is here! A new Btrieve 2 API is included with v13 which offers a simplified way of calling the database from C, but also from object-oriented languages like C++. Even better, a new SWIG API is available for the Btrieve 2 API which offers access from Perl, PHP, Python, and other scripting environments. Get more details from the Getting Started guide. New Schema Export and Import in PCC: A completely revamped solution to exporting and importing your SQL metadata is available in v13, making it possible to recreate your databases, migrate from v1 to v2 metadata, and more. Updated Cache Management: Would you like to purge useless data from your database engine cache? A new option for BUTIL is available to do just that! This command can be used to flush pages from a large, rarely-accessed file from your database cache. Even better -- use the -CACHE option to pre-load data from your critical files into the cache, improving performance for your users! New SDKs: ADO.NET 4.3 modules, as well as .NET Standard 2.0 drivers, are now available (ADO.NET 4.0 has been deprecated in PSQL v13). LIKE with Btrieve Extended Operations: Service Pack 1 adds a new feature for developers -- the ability to use LIKE syntax to search for substrings with the Extended Operations, such as GetNextExtended and StepNextExtended. This feature will provide performance gains to the SRDE right away, and can allow for LIKE searching in your Btrieve applications to provide a substantial speed improvement. Integration with AD Security: Service Pack 1 adds a new Active Directory security integraton feature for the SQL engine. You can create groups in AD, along with matching groups in SQL, and SQL security will be handled through the AD assignment. (A user can still be a member of only one group.) This can ease the administrative overhead for Windows users. Windows Nano Server Support: SP1 also adds support for the Windows Nano Server environment, allowing you to run on a minimim-footprint, non-GUI version of Windows Server designed to run in the cloud or within containers. This engine can be managed remotely via WMI and PowerShell, and it reduces the OS size and security footprint of your environment considerably, saving both storage space and memory. 8-Byte AutoInc/BIGIDENTITY: SP2 adds support for an 8-byte AutoInc data type, which was added (in SP3) to SQL as the BIGIDENTITY data type. TRY_CAST and TRY_CONVERT: SP2 adds two new SQL functions that return NULL if the conversion fails (instead of crashing the query). UPSERT Capability: SP3 adds the UPSERT capability -- attempt an INSERT and if it fails, treat it as an UPDATE instead. You can get the official What's New document now. Officially supported operating systems include Windows 7 and newer, and Windows Server 2008 R2 and newer only, along with various OS X and Linux distributions and versions. Windows Vista, Windows XP, Server 2003, Server 2008 (not R2) and older operating systems are not formally supported by Actian with this release! This does not mean that they will not work, but only that they have not been officially tested or supported by Actian. Please see our Zen v13 License Primer for more information on the various license types and other factors that might help you determine the best license type for your environment. Pricing for each of these license models can be found on our Actian Zen v13 price list, or you can BUY IT NOW from our on-line store. If you want to try out different license models before you buy (a really good idea! ), you can get trial downloads from here. We expect application vendors to start testing Actian Zen v13 soon after its release, and hopefully to announce support for the new version shortly thereafter. If we have heard from your vendor, then our Application Support pages may have useful information already for you. Otherwise, please contact your application vendor directly to find out when they expect to support Zen v13. Maximum File Size Increase: A new file format (which does requires a Rebuild) extends the maximum file size over the old 256GB limit. Depending on the exact file configuration, the maximum file size has been increased to as much as 64TB! Existing applications should work with the new file sizes with no changes. Maximum Record Count Increase: With the new file format, a larger internal record ID is now available, supporting more than 4 billion records in a file (up to 2^64-1). To use record counts over 4B, you will need to modify your Btrieve application to use a new BTRVEX or BTRVEXID extended function call, but this change does not need to be all-or-nothing -- it can be phased in only where needed. The BTRVEX function also supports a new Stat and Create data structure to return record counts over 4 billion. Larger Data Buffer Support: The BTRVEX function call supports a larger data buffer size, allowing your application to read up to 252KB of data in a single database request. This feature can reduce the need for 64KB chunking operations and can further expand the ability to use GetNextExtended calls to increase application performance. SQL Support for 8-byte AutoInc field: The SQL engine has been updated to support the 8-byte BIGIDENTITY data type, which was added to Btrieve in 13.20. ADO.NET Standard Driver: The new ADO.NET provider works with .Net Standard 2.0 systems, including .NET Core. New SQL UPSERT: The SQL engine now contains UPSERT capability via the ON DUPLICATE KEY UPDATE clause. If an INSERT operation fails because the record is already there, the engine can automatically update values in that record for you. This is a paid upgrade to previous versions (PSQLv12 and earlier), but a free patch to users of v13.00 through v13.20. New Platform Support: New PSQL Client components for Rasbian (ARM32) and Windows IoT Core (x86 and ARM32) are now available. Additionally, the new Zen Core for Android embedded database is now available, with iOS to follow! Limited Reporting Engine: While the Reporting Engine in v13.00 allowed remote users to off-load SQL queries to a second server, the Reporting Engine is now limited to LOCAL access only. This is a step backwards, but was needed to address a hole in the licensing mechanism. This may be changed back at some time in the future. New 8-byte AutoInc field: The Btrieve interface now supports a new 8-byte AUTOINC field. Files MUST be in the v9.5 file format, and enabling this feature will make your files inaccessible from engines older than v13.20, so be careful with this feature! Also, you can use the Btrieve API or BUTIL/Maintenance utility to create files with the new 8-byte AutoInc field type, but there is no support yet from SQL for BIGIDENTITY, and Function Executor cannot (yet) be used to create files with this feature. Updated Btrieve 2 API: The Btrieve 2 API has been updated in several areas, such that recompilation of your application may be required. The ability to use the LIKE operator (added in SP1) is now added to this API as well. New SQL Functions: The SQL functions TRY_CAST() and TRY_CONVERT() have been added. Unlike the normal CAST/CONVERT functions, your query will not fail if the data in unconvertable -- the function will instead return NULL. This makes a LOT of sense! This is a paid upgrade to previous versions (PSQLv12 and earlier), but a free patch to users of v13.10 and v13.00. Linux and MAC OS/X Engines Released: The Linux and Mac OS/X engines have been released with this update. Raspbian and NanoServer Engines Released: The Raspbian Linux Engine (for Raspberry Pi) and the Windows Nano Server engines have been released with this update. LIKE with Extended Operations: Developers now have the ability to use LIKE syntax to search for substrings with the Extended Operations, such as GetNextExtended and StepNextExtended. This feature will provide performance gains to the SRDE right away, and can allow for LIKE searching in your Btrieve applications to provide a substantial speed improvement. Integration with AD Security: Windows Server Engine users can now leverage Active Directory groups to implement SQL access rights. This is a paid upgrade to previous versions (PSQLv12 and earlier), but a free patch to users of v13.00. Reporting Engine: Many users have asked for this feature over the years, and it has finally come to fruition! Included FREE with Zen v13 is a new Client Reporting Engine (CRE), which allows you to set up a secondary Zen server for reporting purposes. Now, you can off-load your SQL queries and reports, preserving the performance of your production server. Updated Cache Management: Would you like to purge useless data from your database engine cache? A new option for BUTIL is available to do just that! This command can be used to flush pages from a large, rarely-accessed file from your database cache. Even better -- use the -CACHE option to pre-load data from your critical files into the cache, improving performance for the users! New SDKs: ADO.NET 4.3 modules are now available (ADO.NET 4.0 has been deprecated in Zen v13). This is a paid upgrade to previous versions (PSQLv12 and earlier). Q: Does Actian have an official Zen v13 FAQ or README File? A: You can find download Actian's Zen v13 README now. There is no FAQ yet. A: You can still purchase Actian PSQL v12, which will be supported for a minimum of 18 months from the release of v13. Then, you can choose to upgrade the engine later on, if needed, at a discounted price. Q: Is Actian Zen v13 backward compatible with my older applications? A: Most 32-bit and 64-bit applications should run on Zen v13 with no issues. You may wish to contact the developer to be sure. Officially, 16-bit applications are no longer supported. You may be able to get around this by using our special Requester Patch Pack (scroll all the way down). Q: If my application worked on PSQLv12, will it work on v13? A: It is always a good idea to check with the application developer or to test your own applications. Most new features can easily be ignored by older applications. One noted issue may result due to discontinuing of older ADO.NET drivers. If your application is hard-coded to use an older version specifically, it may break. If the application uses the latest ADO drivers and uses a version-agnostic naming scheme, then it should work just fine! Q: Are all of the Ecosystem products (AuditMaster, DataExchange, Backup Agent) supported on Actian Zen v13? A: Old versions of these products must be removed before installing Zen v13. See our Ecosystem pages for information about versions of Backup Agent, AuditMaster, and DataExchange that are compatible with Zen v13. Q: Is Actian Zen v13 supported on Windows 10 and Windows Server 2016? A: Yes! Zen v13 will run on these newer operating systems. Q: What about Windows Server 2019? A: We expect official support for 2019 will begin with SP3.